Most people think of Beck’s Guero when they hear “Black Tambourine,” but Black Tambourine was a band long before a song, and a musical anomaly at that. The four-piece of Pam Berry, Brian Nelson, Archie Moore and Michael Schulman formed in the greater Washington D.C. area in 1989, recorded a total of ten original songs, played a small handful of live shows and then disbanded in early 1992. They released only two EPs and a handful of singles on labels such as spinART, Audrey’s Diary and most importantly Slumberland, co-founded by tambouriner Michael Schulman. Aside: Slumberland may not sound familiar, but their roster of past artists like Go Sailor, Henry’s Dress and The Aislers Set and current artists ‘Allo Darlin, Crystal Stilts and Dum Dum Girs should ring some sweet little bells. Black Tambourine’s short-lived existence and minute catalog hardly meet the criteria for a “flash in the pan,” but whatever they were was bright, noisy and entrancing. Like their contemporaries Beat Happening and Tiger Trap, Black Tambourine appropriated the British Isles twee sound of acts like Shop Assistants and Heavenly in America. 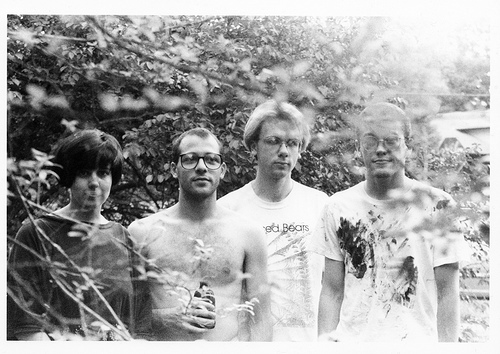 What made Black Tambourine different was their infusion of shoegaze and noise rock. I know that frontwoman Pam Berry does not appreciate the term “twee,” presumably for its pejorative British connotation, but I’m going to coin Black Tambourine’s sound “tweegaze.” (She’s not going to read this anyway) Black Tambourine is a blissful marriage of Talulah Gosh and Jesus and Mary Chain. This marks the first time that I’ve inducted a compilation. Two years ago Slumberland released Black Tambourine which rounded out 1999’s misleadingly titled Complete Recordings with two early demos, two more originals that were never previously released and two covers. It’s exactly 41 minutes of pop genius. Congratulations are in order for Black Tambourine, the most recent addition to the Indie Canon! “For Ex-Lovers Only” and “Black Car” set the listener up for the C-86 meets C-4 explosive wall-of-sound that runs throughout the record. “Can’t Explain” is a standout single (and one of my top 25 played songs of all time); it packs a remarkable pop wallop for under two and a half minutes. A few tracks later, “We Can’t Be Friends” ups the micropop ante matching a Cub-like duration with two times the intensity. “Throw Aggi Off the Bridge” is a tongue-in-cheek tribute to The Pastels. Perry playfully sings “So throw her off the bridge / Just toss her in the drink / She’s coming in between us / You know the girl I mean.” One has to assume that the “Aggi” in question is The Pastels’ keyboardist/vocalist Aggi Wright. Perry’s humorous tale of hero worship envisions Aggi Wright as the only romantic stumbling block between her and Stephen Pastel. Black Tambourine closes with the six additional tracks not found on Complete Recordings. The first demos of “For Ex-Lovers Only” and “Throw Aggi Off the Bridge” capture the energy of a live show in a small venue. “Lazy Heart” and “Tears of Joy” are powerful, unrealized gems of the same era BT. The gorgeous, noisy covers of Buddy Holly’s “Heartbeat” and Suicide’s “Dream Baby Dream” display the band’s gift for adaptation as well as the influence of two true musical innovators. There isn’t a single track to be skipped on the compilation. After the band quietly dissolved each member went on to play in numerous other bands but they never quite recaptured the charm of Black Tambourine. Pam Berry returned to the extremely influential fanzine Chickfactor and Mike Schulman focused his efforts on the Slumberland label which gave breaks to dozens of aesthetically like-minded artists. Black Tambourine reunited earlier this year to celebrate the 20th anniversary of Chickfactor. I regrettably missed one particular midweek show in NYC because I absolutely love my job and would never take a day off ever. The three-day Chickfactor festival was probably the biggest and most important collective of current and defunct twee outfits of the past two decades. Black Tambourine also came out with the OneTwoThreeFour EP, a four-song 7″ of Ramones covers earlier this month. As aforementioned, the band is no stranger to covers, but the new EP is a bit of a head-scratcher. A fan wishes that BT would have spread the cover-love over a handful of artists if they weren’t going to assemble any new material; however, their treatment of four early Ramones love songs like “What’s Your Game” and “I Wanna Be Your Boyfriend” is sincere and delicate at the same time as each song is made their own. The fact that there is no new material and the original four bandmates are all over the world doesn’t forecast a formal reunion. For a cult-status indie band, there doesn’t seem to be much to “cash in” on. Perhaps this recent resurfacing was nothing more than a timely, nostalgic hello and goodbye to fans of one of the truly under-appreciated bands of the 90s.